Background: World statistics for the prevalence of anxiety and mood disorders shows that a great number of individuals will experience some type of anxiety or mood disorder at some point in their lifetime. Mind–body interventions such as Hatha Yoga and seated meditation have been used as a form of self-help therapy and it is especially useful for challenging occupations such as teachers and professors. Aims: In this investigation, we aimed at observing the impact of Yoga Nidra and seated meditation on the anxiety and depression levels of college professors. Materials and Methods: Sixty college professors, men and women, aged between 30 and 55 years were randomly allocated in one of the three experimental groups: Yoga Nidra, seated meditation, and control group. Professors were evaluated two times throughout the 3-month study period. Psychological variables included anxiety, stress, and depression. Results: Data analysis showed that the relaxation group presented better intragroup results in the anxiety levels. Meditation group presented better intragroup results only in the anxiety variable (physical component). Intergroup analysis showed that, except for the depression levels, both intervention groups presented better results than the control group in all other variables. Conclusions: Prepost results indicate that both interventions represent an effective therapeutic approach in reducing anxiety and stress levels. However, there was a tendency toward a greater effectiveness of the Yoga Nidra intervention regarding anxiety, which might represent an effective tool in reducing both cognitive and physiological symptoms of anxiety. In the last decades, a progressive increase in the predominance of mental disorders has been observed in the adult world population. World estimates for the prevalence of anxiety and mood disorders are significantly high, around 25%. This means that a great number of individuals will experience some type of anxiety or mood disorder at some point in their lifetimes, in a continuous or recurrent manner. Stress and anxiety are key components of many mental disorders. The current treatment for them includes evidence-based therapeutic and pharmacological interventions. However, studies found that many a times, patients fail to seek for professional help, which indicates the need for reliable and proper “self-improvement” strategies. Besides, both health professionals and patients agree on two points: (1) it is not satisfactory to spend an entire lifetime making use of drugs and (2) traditional psychotherapy can be extremely costly if carried out for long periods. In addition, clinical trials have demonstrated that anxiolytic drugs and antidepressants have limited effectiveness, cause dependence, affect cognition and memory,, and cause sexual dysfunction. The classical Global Burden of Disease Study published in 1996 showed that psychiatric disorders account for more than a quarter of all health loss due to disability, more than eight times greater than that attributed to coronary heart disease, and 20-fold greater than cancer. These findings highlighted, for the first time, the central place of mental disorders in population health as well as an urgent need for alternative responses from health service systems. There are different therapeutic approaches for the treatment of mental disorders, but many a times, patients look for additional or complementary strategies for different reasons, such as adverse effects of drugs, lack of response to treatment, high cost of psychotherapies, or just personal preference. Some of these complementary or integrative therapies comprehend the so-called mind–body interventions. Specific practices such as Hatha Yoga, relaxation, and seated meditation can be taught as a form of self-help therapy in order to help the patients to achieve a state of mental calm. A great amount of studies have demonstrated the significant effects of such techniques in the treatment of mental disorders.,,,,,, These nonpharmacological interventions called contemplative techniques have no adverse effects (if present, they are minimal), can be practiced by the patients after specific recommendations, and have international acceptance. Besides, with the clime of cost reduction in the health system, brief group interventions might represent relevant preventive methods, when compared to traditional forms of therapy. Maybe, this is the reason why techniques such as meditation, especially mindfulness, are among the most investigated complementary or integrative practice: It is concise, it has a well-defined program, it can be practiced by the patient himself once learned, and it can be used in parallel to any traditional therapy. According to Betonio, teaching is a very challenging job in which the teachers' performance is wrapped up in her/his personality. It requires a unique talent and sense of vocation for the teacher to perform her/his role exceptionally well. This makes teaching is a complex occupation. Depending on the type of college or university, teachers may be juggling many responsibilities, such as teaching a number of course overloads at nonresearch 2- and 4-year colleges and universities, doing different administrative jobs, or fulfilling teaching and research requirements at research colleges and universities. Even more demanding than the complexity of teaching and related responsibilities is the fact that teaching can also generate a high level of anxiety, depression, stress, and fatigue. Contributing factors to this stress include unclear expectations; spending many hours in class; handling classes with large enrollments, planning productive activities, or dealing with difficult or very needy students; newer curricular and teaching approaches, including the use of technology; time involved in student advising and conferences; increasing demands from administrative and committee duties; increasing diversification of expertise; campus politics and meeting the economic necessities of the institution; lack of financial and personnel support; time pressures and deadlines; continual overload of work; and doing research in a continuous manner. These factors may be compounded by student attendance, attention, discipline, and lack of motivation. The latter can be especially stressful because uninterested students disrupt a classroom and the work of other students. Moreover, teaching uninterested or unmotivated students can be exhausting stressful. Therefore, the overall aim of this investigation is to observe the impact of contemplative practices (Yoga Nidra and seated meditation) on the mental health of college professors at the Federal University of Sergipe, Brazil. Hence, the specific goals of this study are: (1) to observe the impact of contemplative practices on the mental health of college professors, (2) to indirectly observe the levels of stress, depression, and anxiety in this community, and (3) to encourage the practice of meditative techniques to reduce risk factors, prevent diseases, and promote a healthy lifestyle. Sixty healthy subjects, men and women, aged between 30 and 55 years, professors at the Federal University of Sergipe, were selected for the study (unfortunately, the sample size was not statistically determined due to practical and administrative issues and general costs, which represent a limitation of the study). Individuals with chronic pulmonary disease, making use of psychotropic drugs, and with previous meditation or yoga experience were excluded from the investigation. Drugs utilized in the treatment of diabetes, hypertension, and heart disease were allowed in the study. Comorbid psychiatric conditions or drug-free status was not clinically evaluated. All experimental protocol was authorized by the Brazilian Ethics Committee, under the registration number 29390514.3.0000.5546 (http://plataformabrasil.saude.gov.br). Group 3 – 20 participants participated as the control group (waiting list). Participants were evaluated two times throughout the study – pre- and post-test time. During a 3-month period, volunteers attended seated meditation or relaxation sessions. All sessions lasted for 45–50 min and were carried out twice a week at the Federal University of Sergipe and a partner yoga center. Contemplative practices, were executed by the first author (a certified yoga instructor), which utilized a detailed attendance register to check the compliance. All experimental protocol of this randomized control trial is represented in the CONSORT diagram [Figure 1] and checklist [Table 2]. [Table 1] presents mean and standard deviation values for the baseline data, showing no significant differences between the groups, except for education years, where the relaxation group showed a higher level of education. It is also called “psychic sleep,” an old yogic practice that provides deep psychological and physical relaxation, while maintaining mental functions functional and alert. During Yoga Nidra, participants remain lied down horizontally with the face and torso facing up (supine position) in a position known as “corpse pose,” while the instructor slowly guides them into deep relaxation using specific techniques in different stages. This study used the Yoga Nidra intervention developed by Swami Satyananda Saraswati, School of Yoga, Munger, Bihar, India. There are a number of meditation techniques available, and almost all of them aim at developing specific cognitive skills, such as attention and concentration. This study has chosen to use mindfulness techniques as the main practice of the meditation group. All mindfulness practices employed here are part of the Mindfulness-Based Stress Reduction Program, described by Kabat-Zinn. However, only seated practices, such as breathing space, mindfulness of breathing, and mindfulness of thoughts were utilized. Psychological variables such as anxiety, stress, and depression were evaluated in two experimental times, pre- and post-test. The following psychometric tools have been used: The Beck Anxiety Inventory (BAI); Hamilton Anxiety Rating Scale (HAM-A); Body Sensations Questionnaire (BSQ); and Stress Symptoms Inventory for Adults Lipp (ISSL). In addition, to examine the impact and acceptance of contemplative techniques, participants answered a small feedback questionnaire , which included items such as reasons for participating in the study, suggestions, motivations, and teacher evaluation. The statistical software Statistical Package for the Social Sciences (SPSS version 20.0, SPSS Inc. Chicago) was used to analyze research data (statistical significance of P≤ 0.05). Histograms were visually inspected to observe distribution features of the continuous variables. Normality distribution was analyzed by a Shapiro–Wilk test and the variability of the data was analyzed by a Levene's test. Results showed the need for a one-way ANOVA for the analysis of baseline data, a 2 × 2 ANOVA with a Tukey post hoc for parametric data and Friedman for nonparametric data. Intragroup difference was calculated by the formula: Δ% = ([posttest – test] × 100/test). Moreover, intergroup difference was calculated by the formula: Δ% = (posttest 1 – posttest 2). For categorical variables such as demographic data, absolute (N) and relative (%) frequencies were calculated. Data were also analyzed in terms of central tendency (mean, median) and variability (standard deviation, variance, and mean). [Figure 2] displays the results for the BAI variable. Friedman's test has shown a statistic difference (Fr = 30.95; P < 0.0001). In the intragroup analysis, an improvement in the mean values of the meditation group was observed. However, only the relaxation group showed significant improvement (P < 0.05; Δ% =75.3%). In the intergroup analysis, statistic differences favorable to both intervention groups have been observed when compared to control group (meditation Δ% =14.9% and relaxation Δ% =16.9%). [Figure 3] displays the results of the Beck Depression Inventory (BDI) variable, in which the ANOVA analysis (2 × 2) showed a statistic difference (F = 2.68; P = 0.032). In addition, there has been a nonsignificant improvement, in the mean values of both intervention groups (intra- and inter-group). [Figure 4] displays the results of the BSQ; Friedman's test has shown a statistic difference (Fr = 29.85; P < 0.0001). 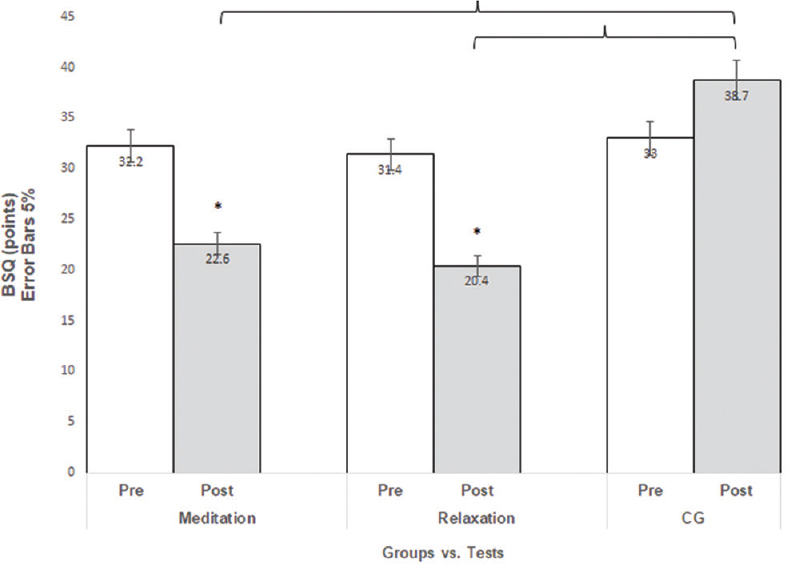 In the intragroup analysis, statistic differences (improvements) were observed for the meditation (Δ% =29.8%) and the relaxation (Δ% =35.03%) groups. 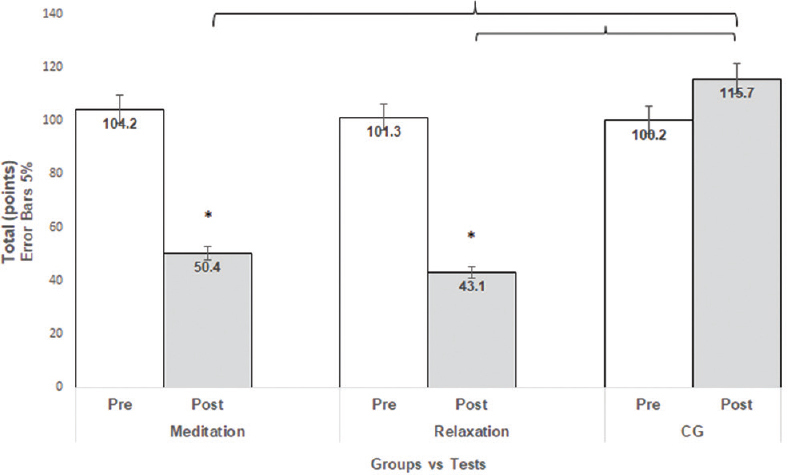 In the intergroup analysis, statistic differences favorable to both intervention groups have been observed when compared to control group (meditation Δ% =14.1% and relaxation Δ% =16.3%). [Figure 5] displays the results for the HAM-A. Friedman's test has shown a statistic difference (Fr = 27.67; P < 0.0001). In the intragroup analysis, statistic differences (improvements) were observed only for the meditation group (Δ% = 53.2%). 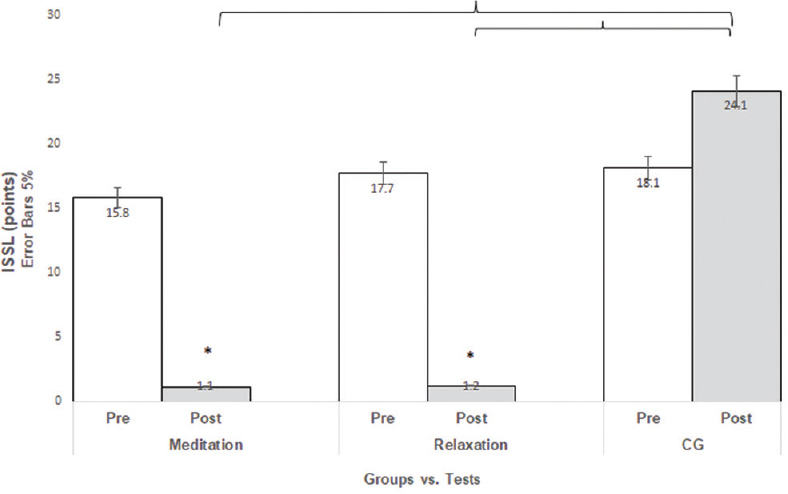 In addition, in the intragroup analysis, statistic differences favorable to both intervention groups have been observed when compared to control group (meditation Δ% = 11.9% and relaxation Δ% = 12.6%). However, no statistical difference was observed when the groups were compared (intergroup). [Figure 6] displays the results for the stress variable (ISSL). Friedman's test has shown a statistic difference (Fr = 26.21; P = 0.0001). 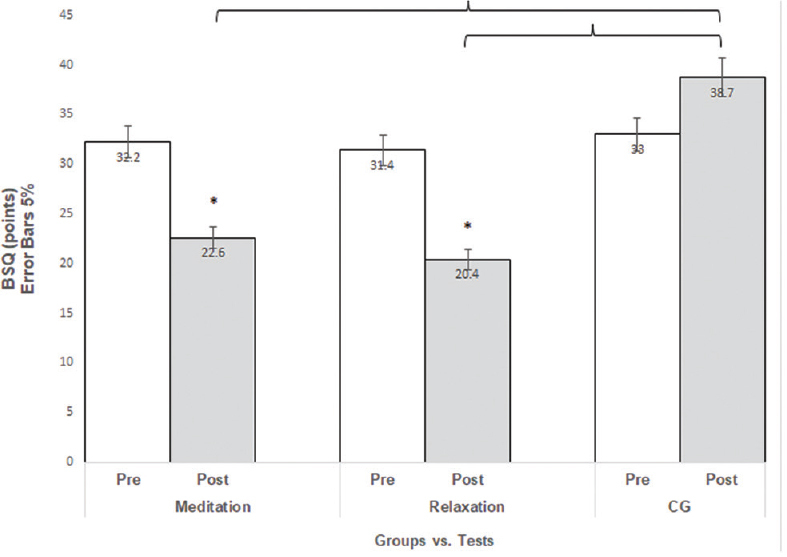 Even though the mean values of the intervention groups have shown some improvement, intragroup analysis showed significant differences for the meditation (Δ% = 93.03%) and the relaxation (Δ% = 93.2%) groups. 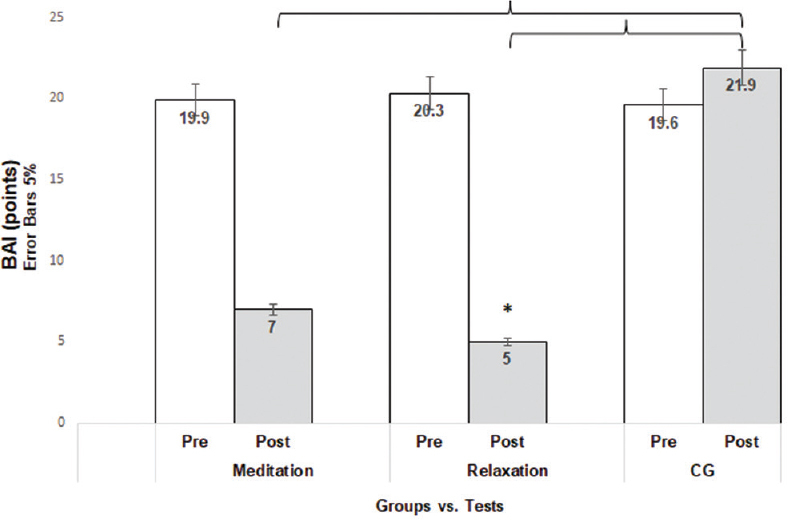 However, intergroup analysis showed statistic differences favorable to both intervention groups when compared to control group (meditation Δ% = 23% and relaxation Δ% = 22.9%). [Figure 7] displays the results for the total general score, in which the ANOVA analysis (2 × 2) showed a statistic difference (Fr = 25.49; P < 0,0001). 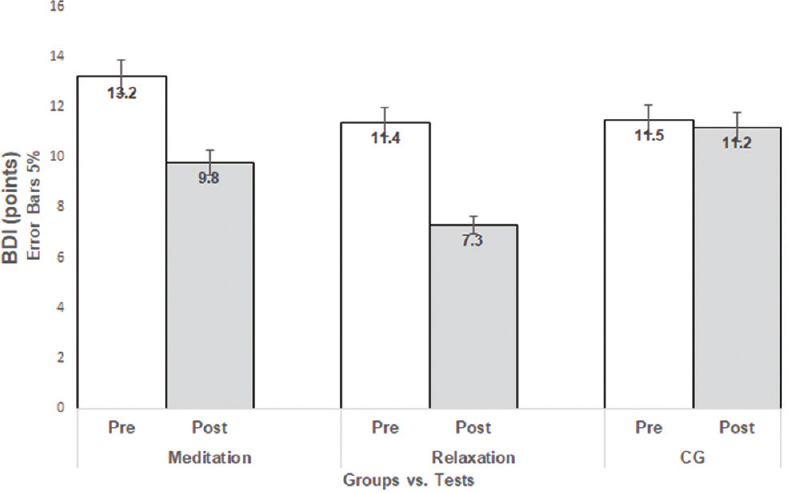 Intragroup analysis showed statistic differences (improvements) for both meditation (Δ% = 51.6%) and relaxation (Δ% = 57.4%) groups. 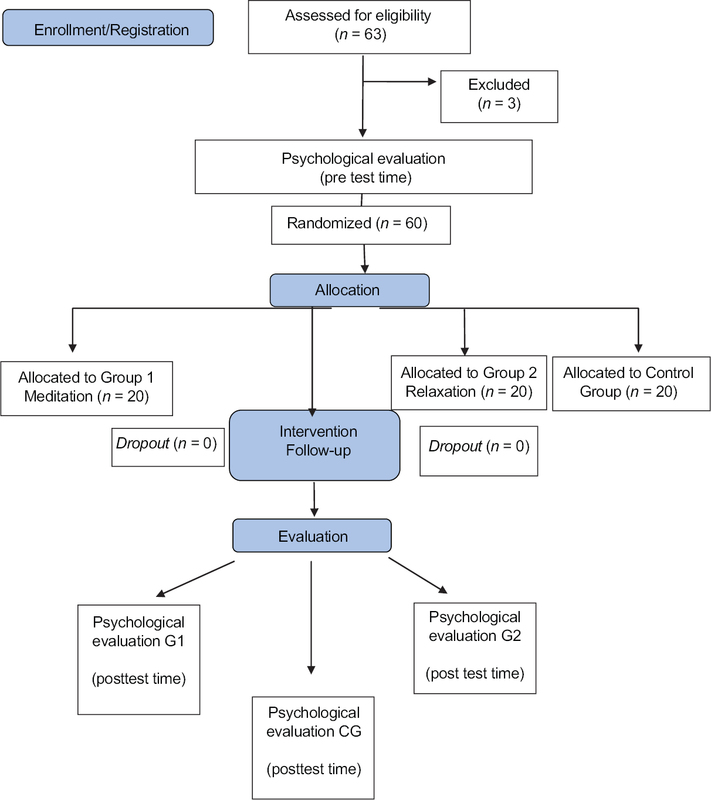 Intergroup analysis showed statistic differences favorable to both intervention groups when compared to control group (meditation Δ% = 65.3% and relaxation Δ% = 72.6%). Anxiety and stress symptoms have a great short-term societal cost. Although the current treatment for anxiety (and mental disorder in general) is the consolidated drug–psychotherapy approach, its consequences include adverse effects of drugs, lack of response to treatment, high cost of psychotherapy, or/and pharmacological interventions.,, Therefore, the need for effective low-cost strategies has become increasingly urgent and necessary because they might provide the individuals with the right tools to cope with anxiety while changing lifestyle and reducing the economic cost. One of these strategies embraces integrative approaches, the so-called mind–body interventions, such as tai chi chuan, seated meditation, and yoga. Yoga practice involves different techniques such as physical postures, controlled breathing, deep relaxation (Yoga Nidra), and meditation that seem to have a particular influence on one's mental state. Research on the overall benefits of yoga practice has revealed improvements in emotional self-regulation with consequent reductions in depression, stress, and anxiety levels, as well improvements in mood, quality of life, and well-being.,, Specifically, Yoga Nidra is one of the yoga's most effective techniques, not only for physical or mental relaxation but also for preparing the mind for yogic discipline. It has been termed “sleepless sleep” because individuals learn to enter the state between sleep and wakefulness without loss of awareness. In spite of being known as a relaxation-meditation technique, Yoga Nidra is, however, qualitatively different from regular relaxation and especially different from seated meditation, mainly for the reasons provided in [Table 3]. Even though Yoga Nidra has been shown to have a significant impact on the relaxation response, contrary to seated meditation, no studies have observed the influence of this practice on stressful occupations, such as teaching. Teaching is a challenging job. It can generate a high level of anxiety, depression, stress, and fatigue. Hence, this investigation aimed at observing the impact of Yoga Nidra and seated meditation at depression, stress, and anxiety levels of college professors. In the present investigation, data analysis showed that the relaxation group presented better intragroup results in the following variables: BAI, BSQ, and HAM-A (anxiety). Meditation group presented better intragroup results only in the BSQ variable. Intergroup analysis showed that, except for the BDI variable, both intervention groups presented better results than the control group. However, no significant difference was found between the meditation and the relaxation groups. Prepost results indicate that the relaxation group might represent a better intervention in reducing the anxiety levels although both interventions were effective when compared to the control group. However, there was a tendency toward a greater effectiveness of the Yoga Nidra intervention. Studies have found that the Yoga Nidra practice (or “state”) appears to reflect an integrated response by the hypothalamus, resulting in decreased sympathetic (excitation) nervous activity and increased parasympathetic (relaxation) function. Results show that there was a significant improvement in positive well-being, general health, and vitality in the Yoga Nidra group. The association of Yoga Nidra with a shift toward parasympathetic dominance  is also related to high cardiac vagal control, which, in turn, is related to reduced anxiety and better subjective and objective sleep quality. In a study on the effects of Yoga Nidra over sleep, the morning practice has been found to increase parasympathetic drive at night causing sleep to be more restorative, which may explain significant improvement in sleep-quality ratings., The authors state that the probable mechanisms affecting sleep quality and subjectively feeling better and less anxious may be linked to cognitive structuring effects of this practice, which makes the mental processing of external inputs more relaxed. The underlying mechanisms involved with Yoga Nidra are not clear at present, but meditation in general is known to target deficits in executive attention that characterize mood and anxiety and psychological symptoms. Image studies have shown that Yoga Nidra activates several brain regions, including the primary sensory cortex. The authors also found decreases in regions involved in executive control, emotion processing, and motor planning, consistent with the hypothesis that these functions are dampened during Yoga Nidra, increasing both physical and mental relaxation and reducing anxiety levels. In a follow-up study, these same researchers demonstrated that Yoga Nidra results in the release of dopamine in the striatum, consistent with decreased motor planning and increased physical relaxation. Even though the results observed in this study regarding Yoga Nidra are promising, the analysis of baseline and demographic data showed no significant differences between the groups, except for education years, where the relaxation group (Yoga Nidra) showed a higher level of education. One possible hypothesis is that the Yoga Nidra instructions could have been better understood by this group due to a higher education level, therefore influencing the results. In the present study, seated meditation has also been found to reduce anxiety and stress when compared to the control group. These findings are corroborated by a great number of studies. Further, the possible mechanisms through which (seated) meditation works is possibly the same as Yoga Nidra's: decreased sympathetic activity, increased parasympathetic function, and increased vagal tone and alterations in neurotransmissions. However, why has Yoga Nidra been shown to be more effective in reducing anxiety levels, both the physical and cognitive symptoms? In Yoga Nidra, it is not necessary to concentrate. The technique is entirely guided and participants just need to follow the instructions and keep the mind moving from point to point, trying to be aware of every experience. In seated meditation, participants needed to count and observe breaths and thoughts or slightly concentrate on them, at least during certain stages. In addition, during Yoga Nidra, the Shavasana posture (corpse pose) is more relaxed, natural, and easy to perform by individuals of all ages and body types, as opposed to the seated posture, which might represent a challenge for many participants for obvious reasons. In addition, the first contact with a still, seated posture may be demanding for beginners, and as a result, meditation might not be as effective as relaxation in reducing anxiety levels. Some authors state that it might even increase stress levels in the short term. However, the increase in stress is transient and part of the process of becoming mindful. Limitations of this investigation include the small sample size for each group, the sample size determination, and the lack of blindness. It is comprehensible that it is difficult to perform double-blinding studies with yoga, but blinding to the outcome assessors and data analyzer has been reported. The present study showed the effectiveness of Yoga Nidra and seated meditation in reducing anxiety and stress levels of college professors when compared to the control group. However, there was a tendency toward a greater effectiveness of the Yoga Nidra intervention, regarding anxiety. Yoga Nidra is easy to perform, does not require a seated posture and concentration, and seems to positively impact psychological variables, such as anxiety and depression. Therefore, it might represent a therapeutic technique with preventive, promotive, and curative value. However, more studies, with different groups of all ages and occupations, are necessary to better elucidate the mechanisms through which Yoga Nidra works. This research was funded by the FAPERJ Agency under the process number 7838.UNI321.21944.25062013. Unützer J, Klap R, Sturm R, Young AS, Marmon T, Shatkin J, et al. Mental disorders and the use of alternative medicine: Results from a national survey. Am J Psychiatry 2000;157:1851-7. Buffett-Jerrott SE, Stewart SH. Cognitive and sedative effects of benzodiazepine use. Curr Pharm Des 2002;8:45-58. Struzik L, Vermani M, Coonerty-Femiano A, Katzman MA. Treatments for generalized anxiety disorder. Expert Rev Neurother 2004;4:285-94. Murray CJ, Lopez AD. Evidence-based health policy – Lessons from the global burden of disease study. Science 1996;274:740-3. Miller JJ, Fletcher K, Kabat-Zinn J. Three-year follow-up and clinical implications of a mindfulness meditation-based stress reduction intervention in the treatment of anxiety disorders. Gen Hosp Psychiatry 1995;17:192-200. Khalsa SB. Yoga as a therapeutic intervention: A bibliometric analysis of published research studies. Indian J Physiol Pharmacol 2004;48:269-85. Weiss M, Nordlie JW, Siegel EP. Mindfulness-based stress reduction as an adjunct to outpatient psychotherapy. Psychother Psychosom 2005;74:108-12. Vorkapic CF, Rangé B. Reducing the symptomatology of panic disorder: The effects of a yoga program alone and in combination with cognitive-behavioral therapy. Front Psychiatry 2014;5:177. Balasubramaniam M, Telles S, Doraiswamy PM. Yoga on our minds: A systematic review of yoga for neuropsychiatric disorders. Front Psychiatry 2012;3:117. Ramaratnam S, Sridharan K (2005). Yoga for epilepsy. Cochrane Database Syst Rev 4:CD001524. Betonio JR (2015). Stress Factors and the Teaching Performance of the College Faculty. International Journal of Social Science and Humanity 5: 651-655. Easthope C and Easthope G (2000). Intensification, Extension and Complexity of Teachers' Workload. British Journal of Sociology of Education 21 (1): 43-58. Saraswati, Swami Satyananda (1998). Yoga Nidra. Bihar School of Yoga, Munger, 6th edition. Kabat-Zinn J (1993). Full Catastrophe Living: How to Cope with Stress, Pain and Illness Using Mindfulness Meditation. New York, NY: Dell Publishing. Beck AT, Steer RA. (1993). Beck Anxiety Inventory Manual. San Antonio, TX: Harcourt Brace and Company. Hamilton M. Development of a rating scale for primary depressive illness. Br J Soc Clin Psychol 1967;6:278-96. Chambless DL, Caputo GC, Bright P, Gallagher R. Assessment of fear of fear in agoraphobics: The body sensations questionnaire and the agoraphobic cognitions questionnaire. J Consult Clin Psychol 1984;52:1090-7. Lipp M (2000). São Paulo: Casa do Psicólogo. Manual do Inventário de Sintomas de Estresse para adultos de LIPP (ISSL). Danhauer SC, Tooze JA, Farmer DF, Campbell CR, McQuellon RP, Barrett R, et al. Restorative yoga for women with ovarian or breast cancer: Findings from a pilot study. J Soc Integr Oncol 2008;6:47-58. Ferreira-Vorkapic C, Feitoza JM, Marchioro M, Simões J, Kozasa E, Telles S, et al. Are there benefits from teaching yoga at schools? 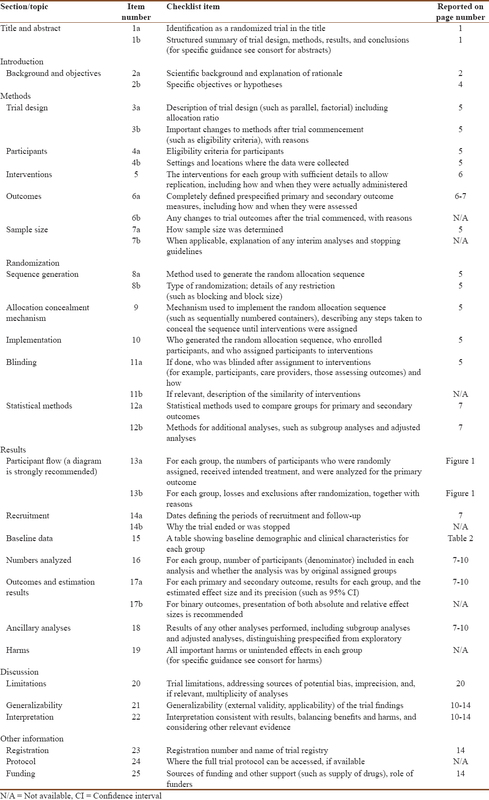 A Systematic review of randomized control trials of yoga-based interventions. Evid Based Complement Alternat Med 2015;2015:345835. Verma V, (Sannyasi Saumya Shakti) (2004). Possibilities of Revolutionising the Education System through Yoga Nidra. Yoga (Bihar School of Yoga); Developed by Barton, Cattell and Curran, adopted by Kapoor S D, (Psycho Centre New Delhi), 1973. Udupa KN (2000). Stress and Its Management through Yoga, (Motilal Banarsidas). Bhushan S, & Sinha P. (2001). Yoga Nidra and management of anxiety and hostility. Journal of Indian Psychology 19, 44–49. Rani K, Tiwari S, Singh U, Agrawal G, Ghildiyal A, Srivastava N, et al. Impact of yoga nidra on psychological general wellbeing in patients with menstrual irregularities: A randomized controlled trial. Int J Yoga 2011;4:20-5. Stankovic L. Transforming trauma: A qualitative feasibility study of integrative restoration (iRest) yoga nidra on combat-related post-traumatic stress disorder. Int J Yoga Therap 2011; 21:23-7. Amita S, Prabhakar S, Manoj I, Harminder S, Pavan T. Effect of yoga-nidra on blood glucose level in diabetic patients. Indian J Physiol Pharmacol 2009;53:97-101. Markil N, Whitehurst M, Jacobs PL, Zoeller RF. Yoga nidra relaxation increases heart rate variability and is unaffected by a prior bout of hatha yoga. J Altern Complement Med 2012;18:953-8. Werner GG, Ford BQ, Mauss IB, Schabus M, Blechert J, Wilhelm FH, et al. High cardiac vagal control is related to better subjective and objective sleep quality. Biol Psychol 2015;106:79-85. Patra S, Telles S. Heart rate variability during sleep following the practice of cyclic meditation and supine rest. Appl Psychophysiol Biofeedback 2010;35:135-40. Deepak KK. Neurophysiological mechanisms of induction of meditation: A hypothetico-deductive approach. Indian J Physiol Pharmacol 2002;46:136-58. Lou HC. et al. (1999). A 15O-H2O PET study of meditation and the resting state of normal consciousness. Human brain mapping 7.2 (1999): 98-105. Kjaer TW, Bertelsen C, Piccini P, Brooks D, Alving J, Lou HC, et al. Increased dopamine tone during meditation-induced change of consciousness. Brain Res Cogn Brain Res 2002;13:255-9. Haden SC, Daly L, Hagins M. A randomised controlled trial comparing the impact of yoga and physical education on the emotional and behavioural functioning of middle school children. Focus Altern Complement Ther 2014;19:148-55.